Using a kid's bike helmet: A mother's effort | Norton Children's Louisville, Ky.
Nine years ago, at age 7, T.J. Floyd lost his independence just as he was discovering it. His parents, Heather and Bo, lost the child they knew — and all the dreams and aspirations they had for him. But out of tragedy, they found a purpose. And they have new dreams and aspirations for their son. T.J.’s laugh pulled Heather out of depression. Inspired to connect with others facing the same challenges, she started an online support group for families affected by traumatic brain injuries. Today she runs two Facebook groups with more than 40,000 members across the world. Heather also started working with state legislators to pass a bill that would raise awareness about the need for children to wear helmets. She took on speaking engagements and learning events. News spread about a message she felt passionate to share: Kids need to wear helmets. “If I can save one family from going through what we went through, if I can help kids understand they can still look ‘cool’ when wearing a helmet, I’m happy,” Heather said. While legislation is not yet passed, Heather, motivated by her own warrior and his infectious laugh, soldiers on. T.J. has improved far beyond anyone imagined after his initial prognosis. He no longer needs a feeding tube (in fact, he loves to eat!) and he is talking, using the bathroom on his own and walking. He has defied many odds, including that he would need to use a wheelchair. His progress is thanks in part to new gait technology funded by the Children’s Hospital Foundation at Norton Mobility Lab at Norton Women’s & Children’s Hospital. The lab has a massive projection screen and treadmill with overhead suspension capabilities. Wearable sensors and cameras track movements so physicians can assess progress and adjust therapies. The Children’s Hospital Foundation and T.J.’s Warriors have teamed up to help more kids wear helmets. You can help by joining the T.J.’s Warriors team for the Splash ‘n’ Dash walk/run on Aug. 3 or by contributing to the group’s cause. It’s much like a virtual reality experience. Patients can experience walking in a forest, riding on a boat or flying a kite. 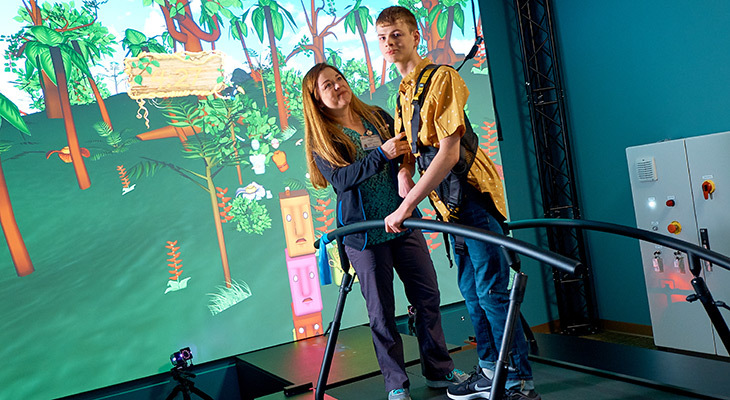 “Because T.J.’s walking is unsteady, we have a great option in the mobility lab: a built-in safety harness along with the interactive video wall that keeps his attention,” said Laura K. Jacks, M.D., T.J.’s orthopedic specialist with Norton Children’s Orthopedics of Louisville. “T.J. is developing confidence in his gait as he strengthens muscles without fear of falling. The games he can play give him a way to compete against himself and see the progress he makes over time. T.J. works with specially skilled physical therapist Natalie Renfrow, who helps T.J. translate his skills into real-world walking. She can suggest or develop safe exercises he can do at home to keep his interest and maintain his strength between visits. For T.J., a teenager now, his parents hope one day he can live in an assisted living environment or maybe even on his own. With targeted therapy and an endless supply of laughter and hope, T.J. is proving that anything is possible. To learn how you can support pediatric rehabilitation, visit HelpNortonChildrens.com.